During his second reign as IWGP Heavyweight Champion, AJ Styles had just the one successful title defense which came against 2015 New Japan Cup winner Kota Ibushi, who despite being a freelancer was and still is considered as one of the best talents to ever step foot into NJPW. 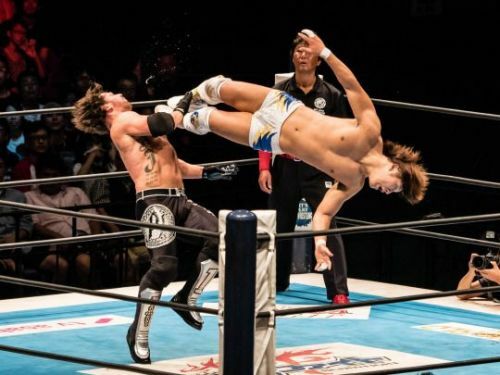 Styles and Ibushi had previously competed in the G1 Climax and this was the rematch between the two men, who in addition also managed to successfully sell out the Sumo Hall in Tokyo a full week before the show. A much faster and athletic Kota Ibushi started off the contest in a really quick fashion to gain the upper hand on the champion AJ Styles, who much despite being one of the greatest X-Divisions of all time somewhat failed to keep up with the quickness of the former three-time IWGP Jr. Heavyweight Champion. But, regardless of that, Styles did put up an amazing fight against Ibushi and proved why he is considered as one of the greatest and smartest workers in the Pro Wrestling industry. In the closing stages of the match, we witnessed one of the most epic finishes to wrestling match, when Ibushi climbed up to the top rope for a Phoenix Splash only for Styles to catch him mid-air after a distraction from Ibushi’s longtime friend Kenny Omega, who at this point was firmly on the side of his fellow Bullet Club stablemate AJ Styles. Shortly after getting a hold of Ibushi in mid-air, Styles eventually connected with the Styles Clash to pick up the win and retain his championship belt.